Ready for a healthier version of pasta salad? 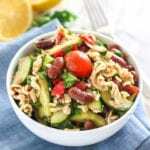 This easy, gluten-free healthy Pesto Pasta Salad is full of flavour and nutrition thanks to simple, real food ingredients. It’s also vegan, quick to prepare, and makes great leftovers! When the pasta is ready, drain all excess water off and transfer it to a large bowl with the remaining salad ingredients. Pour some of the dressing over top and toss well to coat before serving. Depending on how much you love the taste of pesto, you may want to add a little bit more to your dressing. The key is to shake it up before putting it on the other ingredients to avoid getting any overly pesto-heavy bites!